A dike failure at the Kingston Fossil Plant on Dec. 22, 2008 released an estimated 5.4 million cubic yards of coal ash from a dredge cell to the adjacent area, ruptured a natural gas line, disrupted power and transportation, rendered three homes uninhabitable, and resulted in the evacuation of a nearby residential area. The removal of coal ash from the adjacent Emory River was completed in May, 2010. 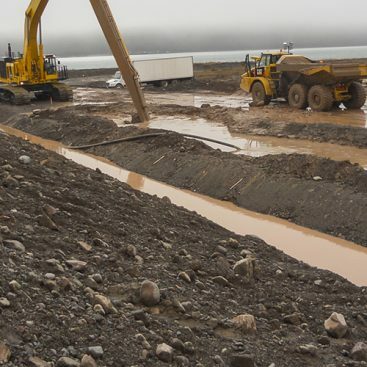 The reconstruction of the failed dike, along with reinforcement of the remainder of the containment cells was completed to prevent future movement of impounded ash. The installation of the Perimeter Wall Stabilization (PWS) was a key component of dike reinforcement. The PWS was divided into eight segments around the property with differing design criteria in each area. The typical design configuration included continuous Inboard and Outboard walls with a series of connecting shear walls that are perpendicular to the Inboard Wall lateral wall segments and were designed to withstand shear loads. In some segments, the shear walls extend beyond the Outboard perimeter wall to form a buttress to the Outboard wall. Each segment had different treatment widths and area-replacement ratios to account for differing failure modes in the most economical manner. 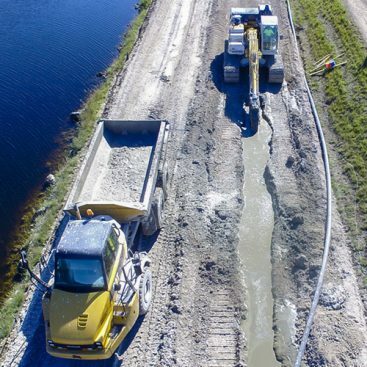 Geo-Solutions installed the PWS using the slurry wall trenching method. 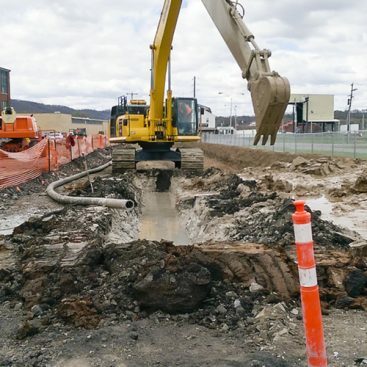 The slurry wall was installed using a custom designed long reach boom and long stick excavators fitted with four foot wide trenching buckets. The trenching bucket was specifically designed for keying the wall into the shale bedrock formation at the site. The trench was excavated using Slag-Cement, Cement-Bentonite slurry, which acts as hydraulic shoring during excavation and cures in the trench to become the permanent backfill material. The self-hardening slurry includes a combination of Ground Granulated Blast Furnace Slag cement, Portland cement, and bentonite slurry. The proportions of the mixture were developed during an extensive laboratory testing program that evaluated over 70 candidate mixtures. Multiple mix recipes have been used in production segments to accommodate different needs in the design. 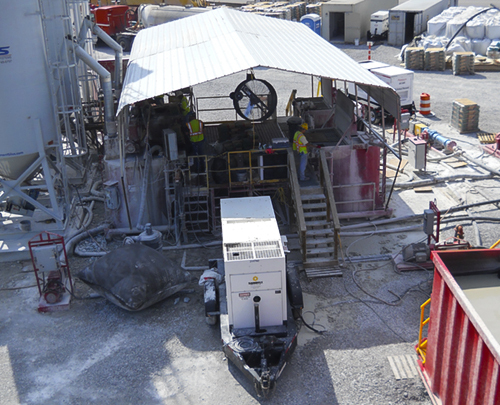 The cured SCCB slurry reached an unconfined compressive strength (UCS) of 200-400 psi. The process is efficient with no wasted mixing; the entire width of the wall is the effective width of the wall. The Perimeter Wall footprint forms a continuous boundary of approximately 11,500 feet around the property. 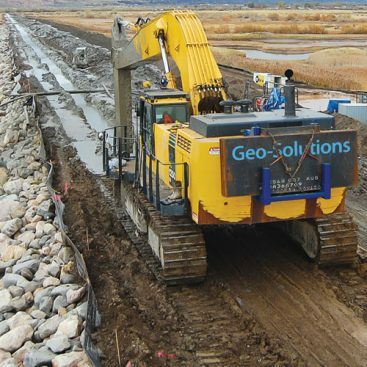 Geo-Solutions installed more than 12 linear miles (560,000 cubic yards or 3,780,000 vsf) of trench, making it the largest Slag-Cement, Cement-Bentonite slurry wall installation in U.S. history. Key project challenges included concurrent design and construction. Geo-Solutions worked closely with the design engineer on upcoming segments of the design to ensure constructability and smooth transition between the segments. An additional challenge was the strata through which excavation occurred. Generally, the top 15 feet of the soil profile consisted of the coal ash which is highly liquefiable. 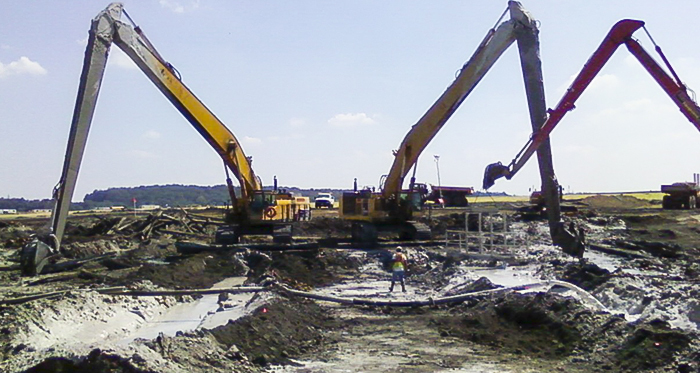 This required care in both the excavation and stability of the work platform. The remainder of the profile consisted of sand and silt underlain with the shale bedrock key-in layer. Because of the displacement during the ash slide, occasional non-native type materials were also encountered.